Your journey will be filled with danger, meeting unfriendly creatures and fierce pirates; in order to survive, you’ll need to prepare by, upgrading your ship, suit, and weapons. After spending over a hundred hours with the game, I can honestly say there is nothing that even comes close to what No Man’s Sky has to offer. In No Man’s Sky, you play as the Traveller who wakes up on a strange new world. You quickly discover that your spacecraft is grounded and you are stranded on an alien planet. After receiving a message from a mysterious entity known as the Atlas, it offers guidance and direction to help you repair your spacecraft. You must collect resources around the mysterious and strange planet, in order to get your spacecraft back up and running. Along your journey to the centre of the universe, you’ll make friends and interact with the many alien species in No Man’ Sky. The rare resources that you discover on your intergalactic journey can be traded, and if you play your cards right you can accrue a fortune that can be used to upgrade your ship. You’ll collect Atlas Stones that you will need as you travel to the centre of the galaxy. While No Man’s Sky’s narrative might not be as deep as many had hoped for, it does a fairly good job of giving a meaning and purpose to the Traveller’s journey. No Man’s Sky’s gameplay is built on four pillars—exploration, survival, combat, and trading. With over 18 quintillion procedurally generated planets, you have complete freedom to do almost anything. Every solar system, planet, ocean, and cave is filled with danger—you’ll have to keep your eyes open and be aware of your surroundings at all times. Quite possibly the biggest feature of No Man’s Sky is the ability to break down items in the environment around you and reconstruct it into items to fit your need. For instance, you can collect raw elements to upgrade your suit and ship. With a deep hunger for knowledge, the Traveller has the ability to scan alien lifeforms and name them. I found this to be very helpful in categorizing and keeping track of the many different alien species I encountered. On some planets you encounter have traces of long gone intelligent species. Going inside these structures can reward you with extra lore and schematics for improving your gear. Communicating with alien species is interesting, while you can walk up to them and start communicating; all that appears onscreen is gibberish. The more you interact with a certain species, the friendlier they become and the more likely they are to trade with you. On the other hand, by helping alien factions you might just make a new set of enemies, as their enemies can become yours. Hello Games did a fantastic job with No Man’s Sky’s presentation, the textures are detailed, and the game has a great art style. There are rare instances when the frame rate stutters for a few seconds, but these are rare and do not take away from the overall fantastic experience you’ll have with No Man’s Sky. In addition to No Man’s Sky’s gorgeous visuals, the games audio is just as remarkable. Just as the game’s planets are procedurally generated, so is No Man’s Sky’s underlying soundtrack. With ambient effects such as roaring dust storms and the eerie cries of the wildlife, Hello Games have created a deep and rich soundtrack that perfectly fits with the sci-fi theme of No Man’s Sky. If you craves exploration, and don’t mind mining minerals—than you are going to love No Man’s Sky. You can literally spend hundreds of hours travelling around the universe. With an overwhelming sense of adventure and imagination, No Man’s Sky will take you to places that have only been dreamed about. 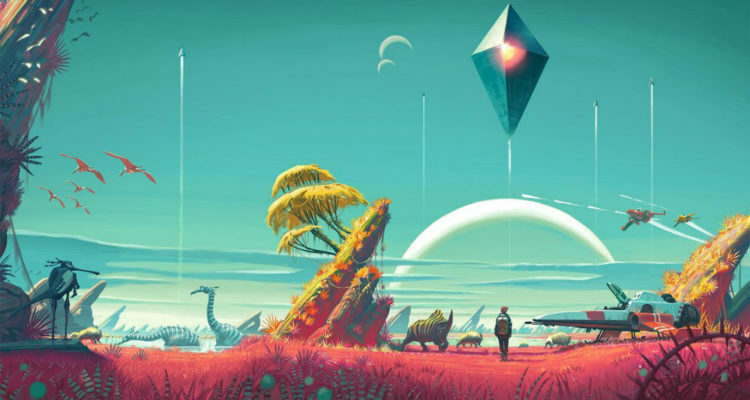 With over 18 quintillion possible planets to explore, No Man’s Sky is quite possibly the largest game ever made. I never grew tired of exploring planets, collecting resources, or interacting with alien species. No Man’s Sky is a sci-fi lover’s dream come true!